a series of five photographic manipulations on paper and acetate in wooden crates each 4' x 8' x 32". The work was originally created for Gallery 44 in Toronto in 1991 and re-made in 1995 for a group exhibition entitled forming memory at the Leonard and Ellen Bina Art Gallery of Concordia University. This work is based on a series of photographs I had taken in 1989 at the Père Lachaise Cemetery (Paris, France) of funerary monuments which have since been destroyed. In Valediction, the exhibition catalogue printed by Gallery 44, I wrote: "I have been thinking that traditions, architectural styles, and artifacts related to death and commemoration can be reflective of individual and collective physical and psychosocial structures; indicators to a variety of attitudes (behaviours) including religious, economic and cultural." In her essay for the same catalogue Terry Constantino, Director wrote: "Devora Neumark continues her investigation of the relation between architecture and objects, and death and commemoration. Her large photographs picture architectural structures erected by the living in honour of the dead. 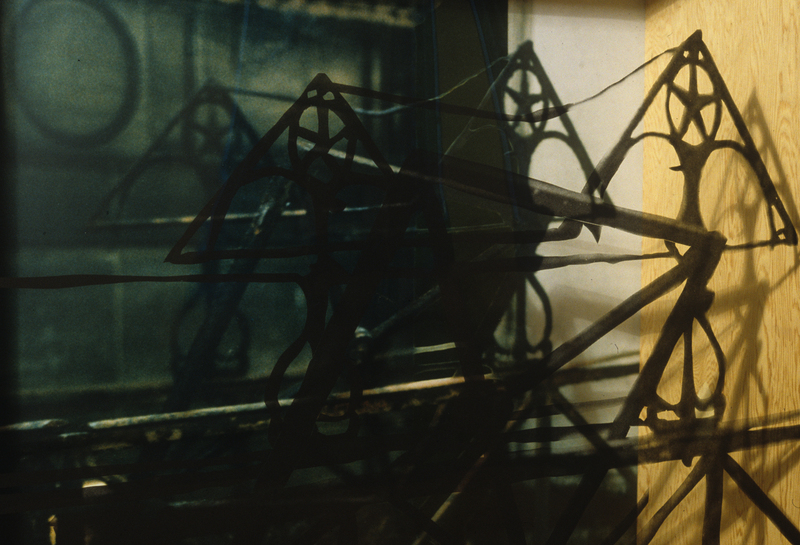 Some of the photographs are recessed behind an image of iron grille-work presented on transparent material. The two images are supported by a large wooden box which bears strong resemblance to a coffin. Although many factors intice the viewer to enter the work, as with death itself, our desire to press forward is prohibited unless we dare to go all the way." "Neumark's three-dimensional constructions add to the depth already inherent in the photographs and reinforce the issue of architecture addressed therein. The choice of materials, and the simple, able way in which these are assembled, stands is sharp contrast to "the trappings of death": velvet lined caskets, stone monuments and mausoleums. The five constructed units are place within the centre of the gallery, well away from the gallery walls. Four unites with images stand like monoliths surrounding a fifth which lies horizontally amongst them. Without an image, the fifth unit acts as a blank slate on which to inscribe one's own (sic) meaning."